OUR FAVORITE ANIMATED SERIES BE-BE-BEARS CELEBRATE ANNIVERSARY! Viewers could watch the first episode of Be-be-bears on the Russian cinema screens within Moolt in Cinema project on 21 March 2015. By now, more than 150 episodes have been released for the last three years! It is already three years that Bucky and Bjorn began sharing their funny adventures in an entertaining way on Moolt and Tloom HD channels that are parts of Digital Television group (VGTRK and Rostelecom). The cartoon tells young audience about true friendship, kindness, and love for nature. Brown bear Bucky and polar bear Bjorn, Chiky, Littlefox and other faithful friends learn to get along and to experience together all adventures. The series have won the viewers hearts not only in Russia, but all around the world as well during this period. Global conquest of international market began in October 2016 with the ambitious launch on the top world markets MIPJunior and MIPCOM (Cannes, France). 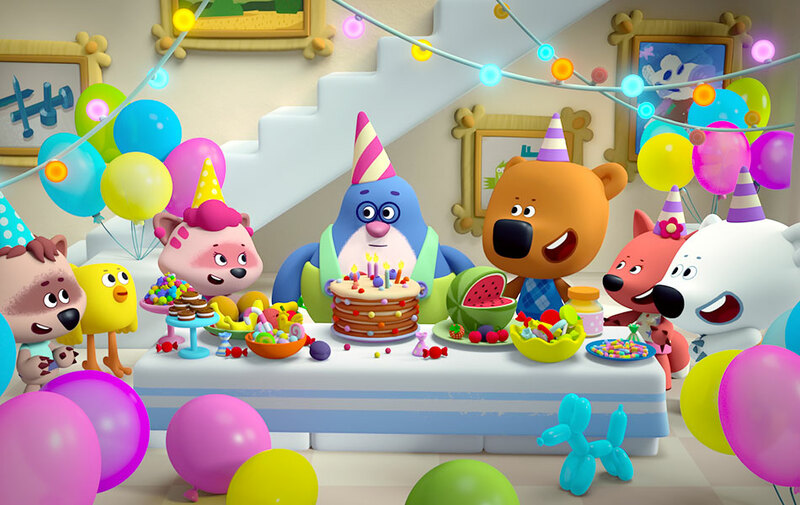 Russian animated series Be-be-bears got into the top-15 of the most demanded TV projects for children in the world, according to results of MIPJunior’s screening. Media rights for animated series were acquired by TV channels and cinemas across the world in less than a year. Be-be-bears are translated into 10 the most popular languages including English, Arabic, Chinese, and Hindi. Little viewers from the USA, North Africa, Middle East met the characters of animated series and became so fond of them. Be-be-bears launched in China with a great success. More than 6 billions viewers watched the cartoons on the web sight of the biggest Chinese video streaming operator LeEco in the first three days. Be-be-bears attract big family audience to TV screens, occupy leading positions in ratings, moreover, professionals of the industry appreciated the quality of animation. In 2016, Be-be-bears was honored with Grand Prix of 23rd Open Russian Animation Film Festival in Suzdal. Series also won in viewers voting in the category Morning Series with a Cup of Cacao and a Bun within 10th Big Cartoon Festival. Nowadays, Be-be-bears series are more than just cartoons. The cartoon has its own licensed products, 7 games for smartphone and tablets. Bucky and Bjorn participated across the whole Russia in the annual major children’s festivals in the country «Multimir» and «Multimir. Bright Summer» which had more than 170 000 visitors in 2017! The bears took part in theatrical scenes, photographed with all who wished, and helped children to take a closer look at a fantasy world. Earlier, in 2016, Be-be-bears held their own winter Olympic Games – The Bears Competition with much success. In the end of 2017, the Moolt Store opened at the Riviera shopping mall in Moscow. There are more than 350 top selling licensed products based on Be-be-bears animated series. In april 2018, all the young fans will meet new dancing competition from the main characters Bucky and Bjorn. The Digital Television children’s channels will arrange a marathon of stories about Be-be-bears for the birthday of favorite characters. Tloom HD channel starts celebrating on Saturday 17 March, from 06:00 till 18:30, and will continue up to 21 March inclusively. Moolt channel scheduled Be-be-bears Day for 24 March from 06:00 till 19:00, and for 25 March from 10:00 till 14:00. During the week from 26 March to 1 April, young audience will watch favorite animated series in Be-be-bears blocks. On Mooltimusic channel Be-be-bears Day will be on 21 March. Viewers will enjoy songs and dances in the company of favorite characters for the whole day! Young viewers in Latin America will have the opportunity to watch the favorite Russian animated series on Moolt channel from 19 to 23 March at 08:00, 16:00, 20:00 and on 25 March from 10:00 till 18:00.